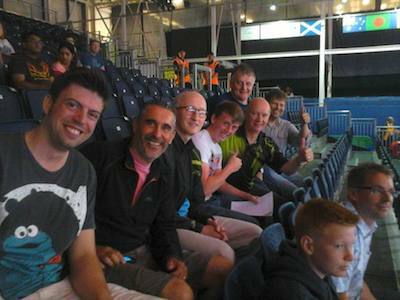 The BBC cameras were waiting to welcome members of St Andrews TTC at the Scotstoun arena in Glasgow. Six of the club stalwarts, accompanied by former member Jon Fraser and Callum Riddoch from the Mylnefield club in Dundee, were hoping to pick up some new tips and tricks for the forthcoming season and to enjoy some great ping pong entertainment. The St Andrews’ lads were mightily impressed by several other players. Hu Li (or is it Li Hu) from the Singapore’s men’s team (and ranked 76 in the world) managed to make the Kiwis look like a team from the lower reaches of the Dundee 4th division. We also enjoyed the banana flick and unique backhand shots of Australian number one William Henzell. And the athleticism, power and forehand side-top spin of Nigerian star Quadri Aruna was striking, more than matching that of club member Nick Shepherd. Any of these players would be very welcome to sign up for the St Andrews teams, though they would need to enter a pre-season tournament to decide whether to register them for the Swots or the Prospects. Here is a picture of us waiting for the matches to begin (from left to right: Jon, Nick, Ian, Callum, Dave, Howard and Collin). English born Dave Goddard was also present in another hall, watching the Scotch ladies play Tanzania in a position match. According to Dave, the “ultimate irony” is that the four Scottish boys in our party preferred to watch the English women compete in the quarter final. The St Andrews representatives will be back at Scotstoun for more action next Friday. Let’s hear it for Glasgow 2014! This entry was posted in Uncategorized on July 27, 2014 by standrewstt.